1. The band formed back in 2010, what made you decide that was the right time to form a band? When I formed the band, I did not think whether it was the right time. Making a decision to create a band is not that difficult. The hard part comes when you have to save your band and not give up. Many people came and left the band. Only the people who are truly devoted remain in it. Nikola Ivanov (Blackie) – drums: Blackie joined the band in the Summer of 2016. Without a good and dedicated drummer things can quickly go wrong. He brought very good energy and dynamics to the band. 3. The music genre for the band is Symphonic Metal, why did you choose this over others? This is the style of music that unites all my searches as a musician and satisfies all my musical senses. It combines both great power and as well unbelievable beauty and romance. I think this is one of the most magnificent styles in modern music that is yet to develop and attracts many new fans. 4. You released a new album titled “For All Beyond”, tell us what we can expect from this album compared to previous debut “Fallen Angel in the Hell”? What you can expect and will surely hear from our album “For All Beyond” is the beauty of each song, much heavier guitars, more dynamic drums, many beautiful melodic lines and orchestral parts and great duets between me and Max Morton, who performed the male vocal parts in some of the songs. 5. Who composes all the songs? I am the composer of all the songs, all the lyrics to them, as well as all the orchestral arrangements. 6. Where does the inspiration come from to write? Inspiration can be found everywhere around us. If you do not want or you are not able to see the beauty of a flying butterfly, you can not expect the inspiration to get you when you are ready. I have always admired the beauty of life that surrounds us – as long as we have a desire to see it. I find inspiration in the sadness also, because often the joy and sorrow go hand in hand. There is no eternal happiness, and eternal sorrow. So, it’s up to you to find an inspiration every day. 7. Do find a certain time of the day/night is better for writing? Yes, I like to work in the evening but not too late. The perfect time for me to compose is late afternoon and evening. 8. Do you personally have a favourite song on the album? If so, why that one. I have a special relationship with each of the song. Of course, all of them are my favorites, but among all of them stands out the titled song “For All Beyond”. I feel it like that because it combines both a sadness and a strength. The duet at the beginning of the song between me and Max literally is breathtaking. The orchestral parts in the song are performed by a live orchestra, which further enhances the influence and power of the song. After the gentle and romantic duet, the powerful force of the orchestra and the whole band enters – the energy of the song changes. From melancholy and gentle it becomes a hurricane. On the very end of the song, again everything is quiet and finds its perfect harmony. That’s why this song is so special to me. 9. You started to record your 2nd album in August 2017, was that an easy process, or were there difficulties? The recordings lasted for nearly two months and the hard part was not in the records themselves but in the details. We wanted to record the tracks in the best possible way and it took a little more time, but the most important thing is that at the end we were really pleased with the material we sent to our mixing engineer. Post production was not easy too and it took about six months. I’m once again convinced that mixing a symphonic metal is a very difficult task. For us, it is very important to emphasize the power of the orchestra tracks combined with vocals, drums, two guitars, bass, piano and viola. This task is not for everyone, but here is the time to express my gratitude and respect to Max Morton, who did an incredible job and made our songs sound world class. We are really pleased with the sound of our album – it was important to produce a quality album with very good songs and great sound and we did it. 10. Where was the album recorded, mixed and produced? The album was recorded by Alexander Nakov at studio “Na Vilata” and mixed and mastered by Max Morton at Morton Studio. All orchestral tracks as well as the piano tracks were recorded by myself in my personal studio. Sofia Session Orchestra was recorded at Sofia Session Studio. 11. Being together since 2010, is there anything you regret, or this is definitely the life for you? The only thing I regret is that during these 8 years I was too patient and good, and for that reason I lost valuable time in which I could find more suitable people for the band. I couldn’t split up on time. When you know that a person or a musician is not right for you and your cause, you have to be able to split up and move on. But probably it must have happened that way and, as we say, every evil for good! 12. If you couldn’t be doing music, what do you think you would be doing instead? Probably I’ll live near the ocean, watching the waves and dreaming about the day I can make music again. 13. Who inspires you musically? I love to listen to the music of many composers and many bands. But what truly touches my heart is Music of Mozart, Vangelis, Queen and Thomas Bergersen. 14. When you were growing up, what age was it that you decided you wanted the band life? I can not say the exact age, but from a very small age, while I was studying at the music school, I dreamed to be more than just playing an orchestra all day. I was a rebel in my sould, but a great perfectionist and I wanted to be the best in everything – playing, education. This perfection prevented me from doing what I really want and it took me a long time to balance these two opposing features and to use them both to follow my dream. 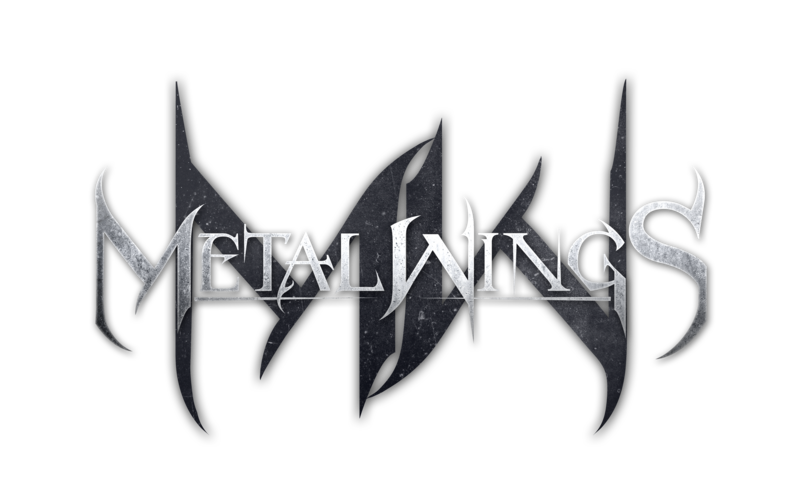 At this stage, perhaps the most interesting thing to know about Metalwings is that I have already composed the music and wrote the lyrics for two more albums. So, get ready for us! Is there anything you would like to add to this interview that we should know? I would like to say: Thank you to all our fans who support us and like our Music. It really means a lot to us! Respect! Thank you so much for taking the time to do this interview with us, we greatly appreciate it.